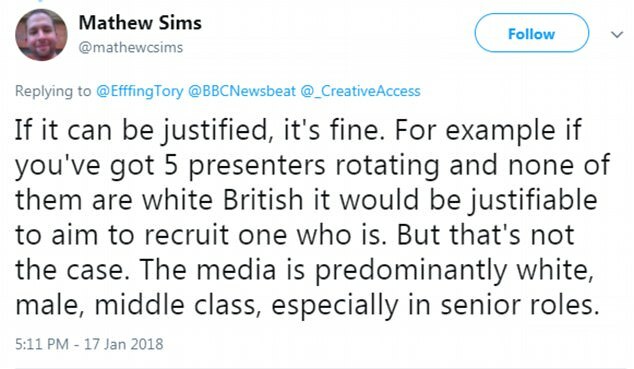 The BBC has come under fire for excluding white people from applying to a trainee journalism post. The traineeship with Newsbeat, the BBC's current affairs outlet for 16-25 year olds, is touted as 'the ideal environment for multi-media training that is so rewarding to experience early in a journalism career' according to the job advert. However, it is only open people from a black, Asian or non-white ethnic minority background. The job advert says they are looking for someone who can 'offer a different perspective on stories that affect the key target audience of 16-25 year-olds'. The trainee will work on radio broadcasts, and online including the website and on social video. They will be taught 'how a busy newsroom operates' as well as video-editing skills and how to formulate 'engaging editorial ideas'. 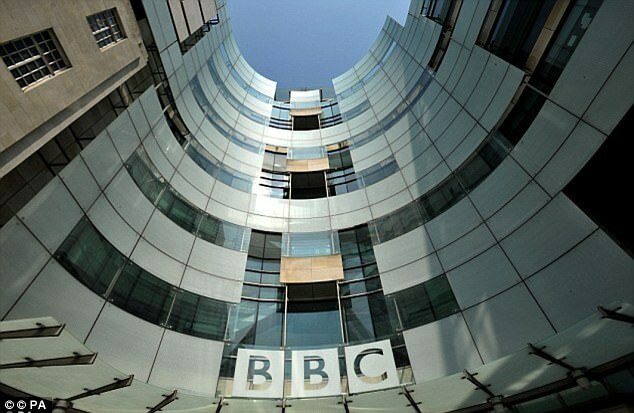 Outrage has ensued on social media after BBC newsbeat shared the job advert. Journalist Victoria wrote ' My nephew would like to apply, he’s fair-skinned though. How should I tell him he doesn’t qualify? 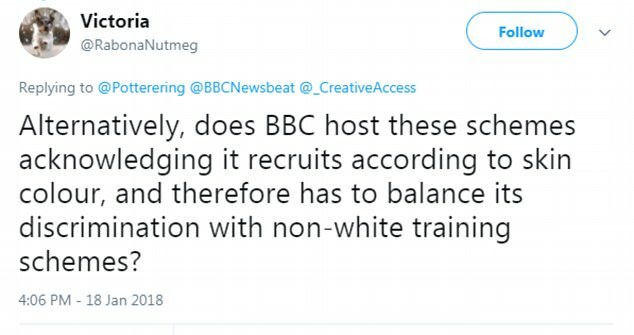 'Alternatively, does BBC host these schemes acknowledging it recruits according to skin colour, and therefore has to balance its discrimination with non-white training schemes? 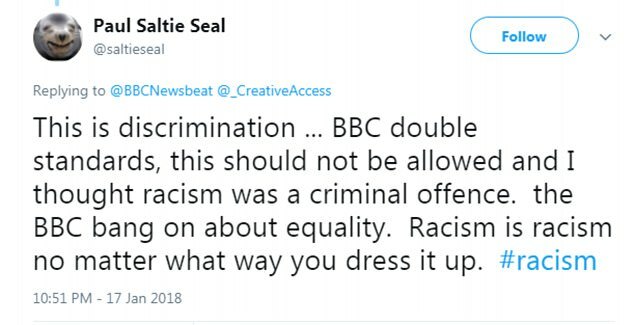 Others went a step further, and accused the BBC of racism and discrimination. However, others defended the public broadcaster. The BBC attracted criticism in June 2016 after turning down applications for roles because they were white. It advertised for two junior script writers on 12-month trainee schemes, one of which offered the opportunity to work on hospital drama Holby City in London. 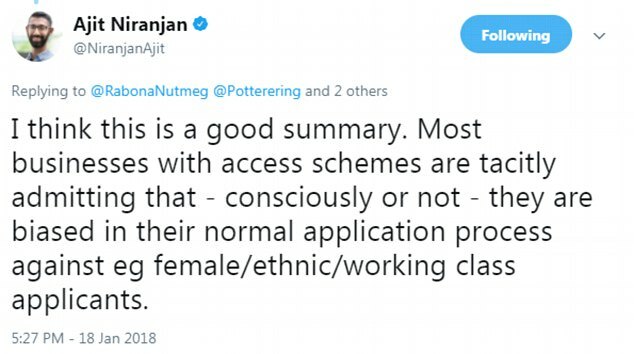 But applicants were outraged when HR bosses replied to applications saying that they were only open to people from 'ethnic minority backgrounds'. 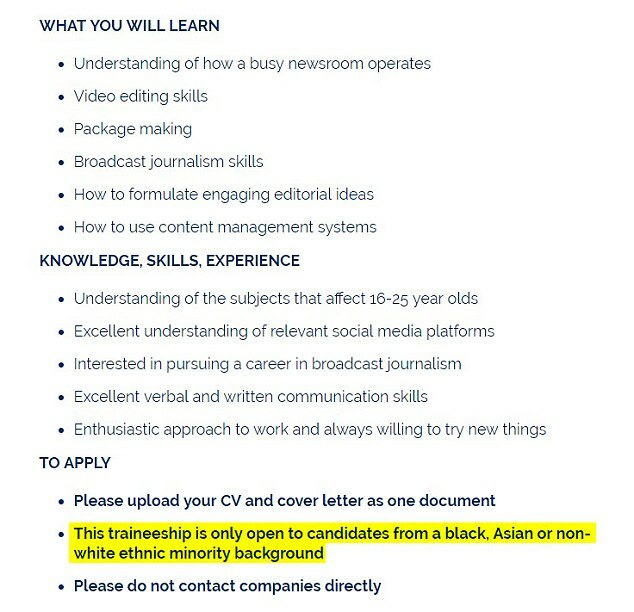 It later attracted further criticism when it offered 12-month trainee broadcast journalist post that was 'only open to candidates from a black, Asian or non-white ethnic minority background' in November last year. ITV also faced criticism when it advertised an intern position for flagship politics show Peston on Sunday that wasn't open to white applicants. A BBC spokesperson said: 'The Scheme is organised by Creative Access, an independent organisation dedicated to increasing diversity in the creative industries, whose other partners include ITV, United Agents, Faber and Faber, and John Murray.